Celebrate the seasons and holidays through art, crafts, and cooking together, with my new book, The Artful Year. The book is already on the Bestseller lists for each of its categories on Amazon (and #1 for Seasonal Crafts) as well as on the Hot New Release lists for each of its categories (and #1 in Crafts for Children)! 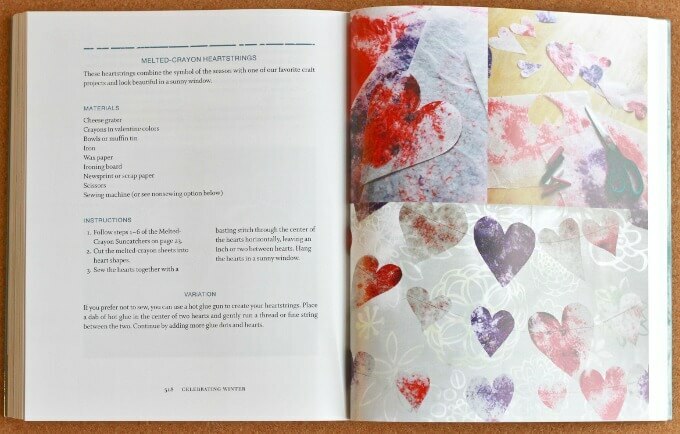 The Artful Year is a book that you’ll refer to throughout the year, and again year after year, as you celebrate the changing of the seasons, establish family traditions, and make memories together. In The Artful Year, I share a year’s worth of art projects, seasonal activities, and recipes (175+ activities in all!) for simple, family-friendly crafting through the seasons and holidays. IN OUR HOME, WE CELEBRATE THE SEASONS AND HOLIDAYS THROUGH ART, CRAFTS, AND COOKING TOGETHER. We mix the familiar (gingerbread cookies) with the unique and creative (stained glass garlands). Plus, we’re always trying out new ideas and combinations. Celebrating the seasons and holidays is a wonderful opportunity to embrace creativity together as a family. It’s also a fun way to decorate, prepare for, and learn about the holidays we celebrate. Memories and mementos, creative growth in our children and ourselves, stronger family bonds, and lots of fun! Suggested reading lists of children’s picture books about the seasons and holidays—some of our favorites, plus a more extensive list at the back of the book. The Artful Year is available on Amazon, RoostBooks.com, Barnes & Noble, Powells.com, and at your favorite bookstore. For all media requests, including review copy or excerpt requests, please contact Roost Publicity via e-mail at [email protected]. Check out The Artful Year blog tour. The tour includes activities, recipes, giveaways, and reviews of the book, on some wonderful blogs.